If there's a policeman or policewoman in your family, or you'd like to pay tribute to these brave people who put their lives on the line to protect us, you'll love our Police Officer Garden Gnome. The police gnome stands strong and proud in his uniform and badge, and comes equipped with a pistol and handcuffs. 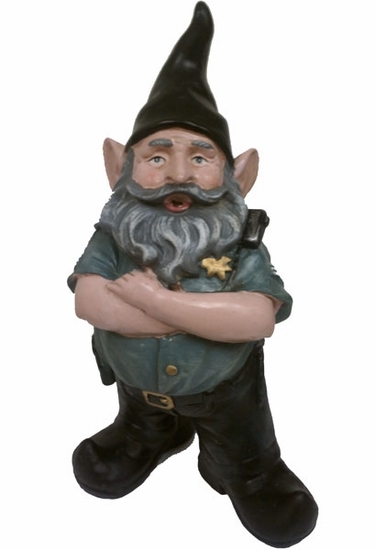 With our police gnomes standing guard, you'll feel assured that everything in your garden is under control. A police gnome makes a terrific gift for any officer and their family. We also have the Fireman Gnome. All our garden gnomes are made from weather-resistant cast stone and this policeman gnome stands 13 inches tall.